Sorry, this title is not available ! 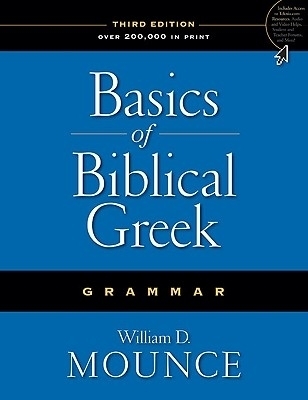 Basics of Biblical Greek Grammar is a general introduction to New Testament Greek, mixing the best of both traditional and modern language learning methods. Students are taught all of the common vocabulary and grammatical forms occurring in the New Testament in a manner requiring far less rote memorization than most other approaches. Memorization of vocabulary is highly focused and centered only on the words truly necessary to begin reading from the Greek New Testament. Rather than having students memorize chart after chart of forms, Dr. Mounce teaches a limited number of rules and endings from which all of the others can be derived in a logical manner. Since it was first published in 1993, this text has enabled over 200,000 students to learn Biblical Greek. The Third Edition adds a great deal of new supplemental material. Students are given the opportunity in the new "professor" sections to learn optional high-interest vocabulary such as greetings, colors, and the days of the week. These same sections also lighten the mood of the text at times by offering fun classroom activities such as well-known songs translated into Biblical Greek. This electronic edition makes Dr. Mounce's popular text available in a convenient digital format. It adds nearly 2,000 hyperlinks between the main text and the appendix, making it even easier to look up additional information on forms or vocabulary. Users of The Bible Study App can even use the "look up" feature to find vocabulary words in the lexicon at the end of the text. Verse references have been tagged whenever possible throughout the exegesis sections, allowing students to look up the full text of the verses used in the the examples and exercises. Dr. Bill Mounce explains the benefits of learning Greek.